From Wardandi (WA) to Kalaw Kawaw Ya (FNQ), this atlas will locate any Aboriginal nation. The green symbolises the land. 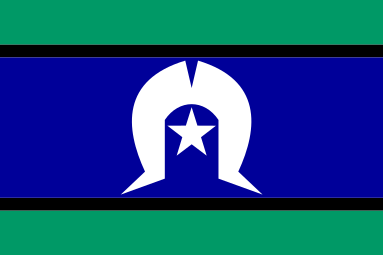 The blue represents the waters of the Torres Strait. The white five-pointed star symbolises peace, and represents the five major island groups. The white dhari (dancer's headdress) symbolises the Torres Strait Islands people. The thin black stripes signify the Torres Strait Islanders themselves. Aboriginal, (meaning from the beginning) and other European words are used because there is no Aboriginal word that refers to all Aboriginal nations. About 80% of the Torres Strait Island population now resides outside the Torres Strait and terms such as Murray Island Peoples and Mer Island Peoples are also used. Koori, Murri, and Nyoongah are appropriate for the areas where they apply. There are local names for particular language groups, for example Gamilaroi (nsw) or Pitjantjatjara (nt - sa). Some people use Nunga in general reference to people who reside in and around the area of Adelaide. The local Aboriginal community can clarify appropriate use of all of these terms, and can be consulted for further advice. These terms stress the humanity of Aboriginal and Torres Strait Islander people. Inappropriate terms tend to suggest that Aboriginal people are all the same, and thus stereotypes Aboriginal Australians. Although less appropriate, people should respect the use of these terms. The Aboriginal English words blackfella and whitefella are used all over the country; some communities also use yellafella and coloured. Assimilation: A 19th century idea that Indigenous people should be 'improved' by being 'civilised' and becoming Christians and learning how to work as Europeans did. From the 1930s assimilation became government policy. Colonialism: The forcible takeover of the land of indigenous peoples and the exploitation of the land and the people, ignoring the rights of indigenous people. Country: A term used by Aboriginal people to refer to the land to which they belong and their place of Dreaming. Aboriginal language usage of the word country is much broader than standard English. Culture: The accepted and traditionally patterned ways of behaving and a set of common understandings shared by members of a group or community. Includes land, language, ways of living and working artistic expression, relationships and identity. Dreaming: The Dreaming has different meanings for different Aboriginal groups. The Dreaming can be seen as an embodiment of Aboriginal creation which gives meaning to everything. 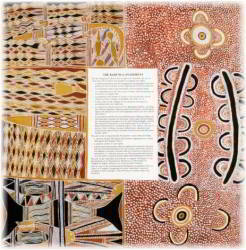 It establishes the rules governing relationships between the people, the land and all things for Aboriginal people. Elders : Men and women who are respected for their wisdom and knowledge of their culture and maintain social order according to the Law. The word Elders should be written with a capital letter as a mark of respect. Heritage: That which comes or belongs to one by reason of birth. Indigenous: Native to a place or area, originating in and characterising a particular region or country. Aboriginal Australians: the original inhabitants of Australia; always capitalised. Includes Aboriginal and Torres Strait Islander peoples. Indigenous people: The first peoples to a land. Kinship: An importance part of Indigenous cultures and values. It includes all relationships and being related to and belonging to the land. Law: Social control based on consensus and individual rights being subordinate to the welfare of the community. Land Rights: The struggle by Aboriginal people to gain acknowledgment of prior ownership of this land both legally and morally and allowing all the accompanying rights and obligations which stem from this association. Land use: The way land and water were used and maintained both physically and spiritually. Lore: The learning and transmission of a cultural heritage. Massacres: Indiscriminate killing of Aboriginal people by government forces, private killing parties and individuals. Macassans: Fishermen from Sulawesi (now Indonesia) who came to coastal northern Australia to trade with Aboriginal people. Missions: Areas originally set up and governed by different religious denomination for Aboriginal people to live. Today some people use the term to refer to Aboriginal housing developments. The terms "reserves" and "stations" are used as well. Native title: Form of land title which recognises Aboriginal people as rightful owners of that land. Racism: Set of beliefs, often negative, held by one group of people or individuals, about another group of people or individuals and based on the perceived racial characteristics of that group or individual. 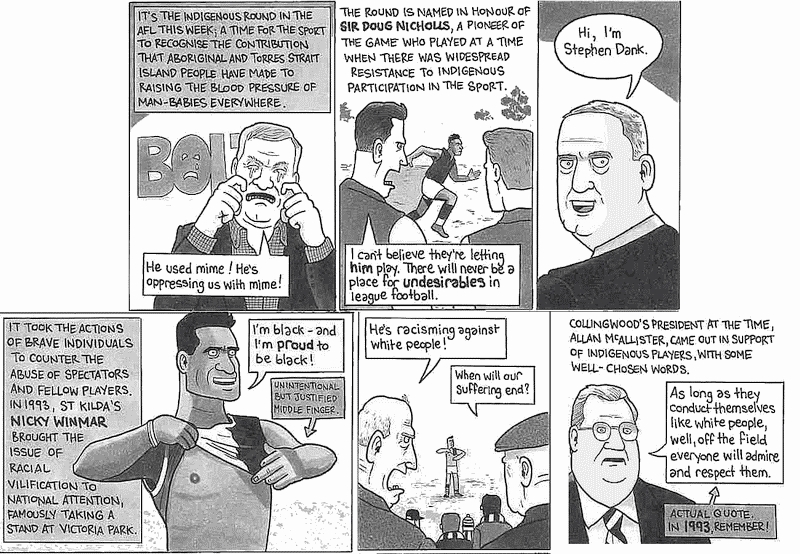 Racism in Australia takes on many forms - attitudinal, institutional and cultural. Reconciliation: A Commonwealth initiative to promote reconciliation between Indigenous people and the wider community and to redress Indigenous disadvantage. Reserves: Areas of land reserved by the Crown for Aboriginal people in the 19th century. Much of this land was later taken from Aboriginal people again. Until the 1970s the remaining reserves were administered and controlled by government. See also missions and stations as these terms are also used. Stations: Living areas established by governments for Aboriginal people on which managers and matrons controlled (and 'cared for') Indigenous people. Social Justice: Being entitled to the same rights and services as all other citizens. Terra nullius: A concept in international law meaning 'a territory belonging to no-one' or 'over which no-one claims ownership'. The concept is related to the legal acceptance of occupation as an original means of peacefully acquiring territory. However, a fundamental condition of a valid occupation is that the territory should belong to no-one. The concept has been used to justify the colonisation of Australia. The High Court decision of 1992 rejected terra nullius and recognises Indigenous native title. Aboriginal Australians named all of Australia in their languages before British colonisation. Part of the process of colonisation has been the renaming of places and natural features all over Australia. The best-known example, Ayers Rock was a British name imposed on Uluru, a significant site in Central Australia which should be respected and recognised. Until 1972 when the policy was abolished, Aboriginal Australian people were excluded by definition. Exemption certificates were issued to Aboriginal people with lighter skin colour. This allowed them the same basic freedoms that people without Aboriginal heritage took for granted as citizens. The assumption was that any Aboriginal or Torres Strait Islander person with any European blood was more intelligent, and a fitter member of Australian society. In 1988, as part of Bicentennial celebrations, Prime Minister Bob Hawke visited the NT where he was presented with a statement of Aboriginal political objectives at the Barunga festival. It was painted on a 1.2 metre square sheet of composite wood. 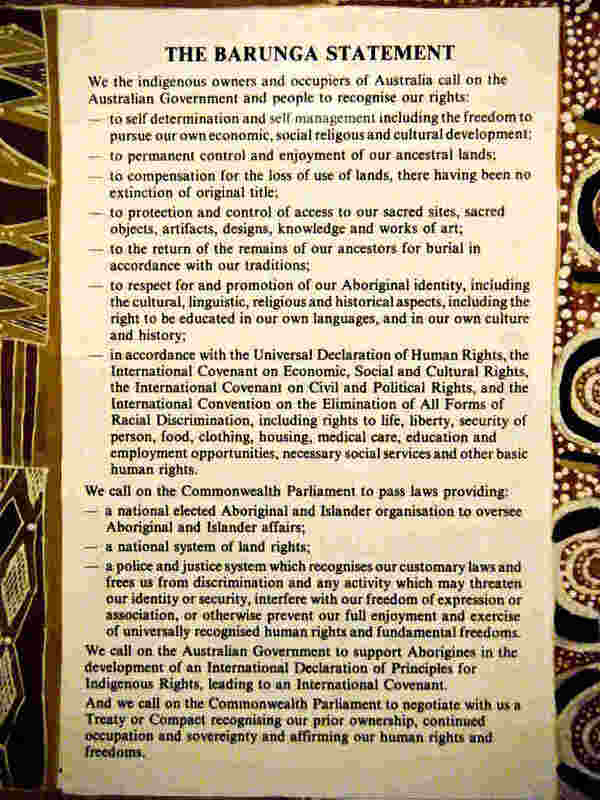 Called for Aboriginal self-management, a national system of land rights, compensation for loss of lands, respect for Aboriginal identity, an end to discrimination, and the granting of full civil, economic, social and cultural rights.Hawke wished to conclude a treaty between Aboriginal and other Australians by 1990, but his wish was not fulfilled. Controversy erupted over the exposure of sacred material in the bark painting, leading some Indigenous leaders to call for its return. Some leaders alleged the presentation of the painting resulted in at least ten deaths due to munya, which translates as remorse in the Aboriginal system of payback. In 1991, his last act as Prime Minister was to hang the Barunga Statement at Parliament House. ...its presence here calls on those who follow me, it demands of them that they continue efforts that they find solutions to the abundant problems that still face the Aboriginal people of this country. The Australian Aboriginal band, Yothu Yindi, wrote the hit song ‘ Treaty ’ to commemorate the statement. Lead singer Mandawuy Yunupingu, with his older brother Galarrwuy, wanted to highlight the lack of progress on the treaty between Aboriginal peoples and the Federal Government. Bob Hawke visited the Territory. He went to this gathering in Barunga. And this is where he made a statement that there shall be a treaty between black and white Australia. “Well, I heard it on the radio. And I saw it on the television.